Match report starts just below the first image. 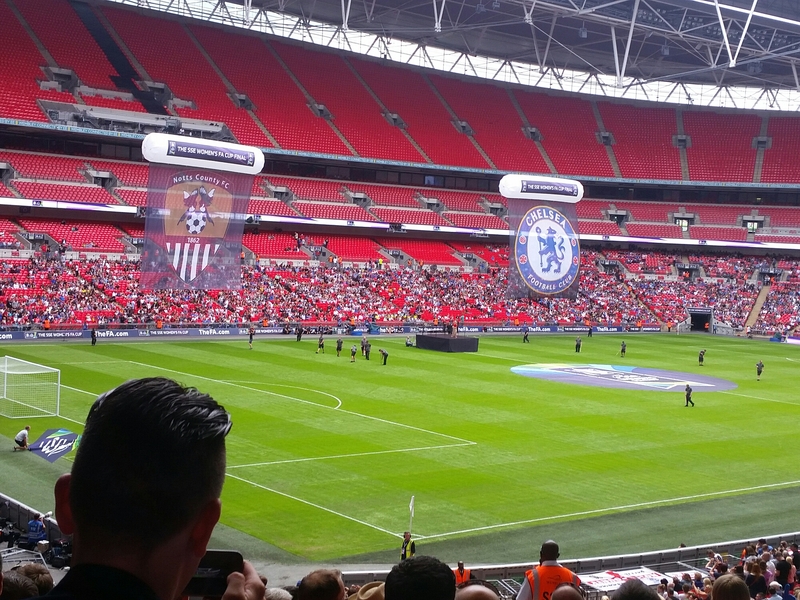 Last year I was at the Women’s FA Cup Final (I did a match preview for last years game here. Chelsea v Notts County provided the game, being played at Wembley for the first time, with lots of actions before crowning Chelsea as the winner. I was unable to get to the game between Arsenal and Chelsea at Wembley (Saturday 14 May 2016) but have put together the following for anybody that missed it and would be interested. And this year Chelsea had the chance to keep hold of the trophy by competing against Arsenal. Chelsea entered as favourites after not losing a single game (four played as they went into the final) in the Women’s Super League this season (something I also reported on last year). Arsenal started strong and asserted dominance in the match by taking an early lead, thanks to Danielle Carter, launching a ball over and out of reach of the keeper before it curled down into the far top corner. The club and players knew that a win would send a message to their WSL rivals that they are ready to really get their campaign underway to get into contention for the end of the season. Chelsea, the defending holders were already on the back foot and needed to dig deep to try and pull it back. Throughout the first half Arsenal did not relax. Instead they carried on applying the pressure and as the second half got underway their momentum continued allowing them to nearly double their lead. The Arsenal wingers were brought to life and carried on attempting to break through the defence. If it was not for Chelsea having the world class Swedish goal keeper Hedvig Lindahl then they could have easily conceded several more goals. Despite being down a goal Chelsea had the ability to bring on some great quality players from the bench to get back in the game, including Eni Aluko, that brought immediate life to the game from the 55th minute and at moments should have contributed to gaining an equalisier. Despite pace and excitement being brought to the Chelsea team they were still unable to stop Arsenal from knocking on the door with corners and free play. And amongst all the chances from Arsenal a little bit of amusement was added in as the lineswoman needed a replacement flag. As the 70th minute arrived and Chelsea achieved their first corner of the match it was clear Arsenal were going to continue to dominate and were refusing to take any risks. As their keeper was down receiving some treatment they prepared to bring some fresh legs to the game by bringing Danielle Van De Donk and Dominique Jannsen on for Kelly Smith and Fara Williams. With Arsenal continuing to hammer home their desire to win, as the clock went into the last ten minutes of normal time, Chelsea started to try a little too hard allowing for a counter-attack to take place and very nearly double Arsenal’s advantage. Despite their best efforts Chelsea could do nothing to keep hold of the title, that seen them do the double last season, at the end of four minutes added time had to hand the SSE FA Cup back over to Arsenal who have now won a whopping 14 times since 1971. This entry was posted in Sport, Women's Football and tagged arsenal, chelsea, english, english football, final, football, lblog, lblogger, lbloggers, life, Lifestyle, lifestyle blog, lifestyle blogger, lifestyle bloggers, match, match report, Sport, wembley, Women's Football. Bookmark the permalink.